13 1/8 by 9 1/8 in. The Bull’s Eye epitomizes Doré’s technique for capturing life in the dangerous neighborhood of Whitechapel. 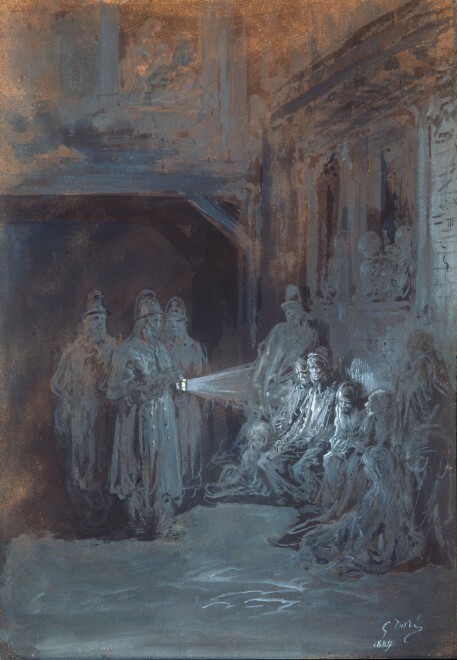 One of the works sent to New York circa 1895 for the prospective Doré Gallery project, which never came to fruition, and where it remained until the pictures were dispersed by the Manhattan Storage and Warehouse Company on 28th October 1947 in order to pay for their storage charges. 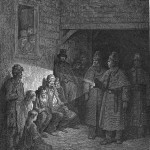 Henri Leblanc, Catalogue de l’œuvre complet de Gustave Doré, Paris, 1931, n°92 (d’après Duplessis), p. 489 as « Une descente de police dans un bouge à Whitechapel ». This watercolor is a study for The Bull’s Eye, one of Gustave Doré’s 180 engravings that illustrate the 1872 book London: A Pilgrimage. Begun in 1869 when journalist Blanchard Jerrold (1826-1884) joined forces with Doré, the volume was conceived as an illustrated record of the shadows and sunlight of the English capital through the lens of a French-English cultural dialogue, the interpretation of the English people and architecture by a Frenchman. For Doré, who must have already been familiar with London, a city widely known for its futuristic urban planning, its density and very contrasting social realities, this book was an opportunity to immerse himself in the British capital and explore its paraded wealth in the West End and motley misery in the East, particularly in the area of Whitechapel, near the docks. As Jerrold later recalled, they spent many days and nights exploring the most dangerous parts of Whitechapel, often protected by plain-clothes policemen. 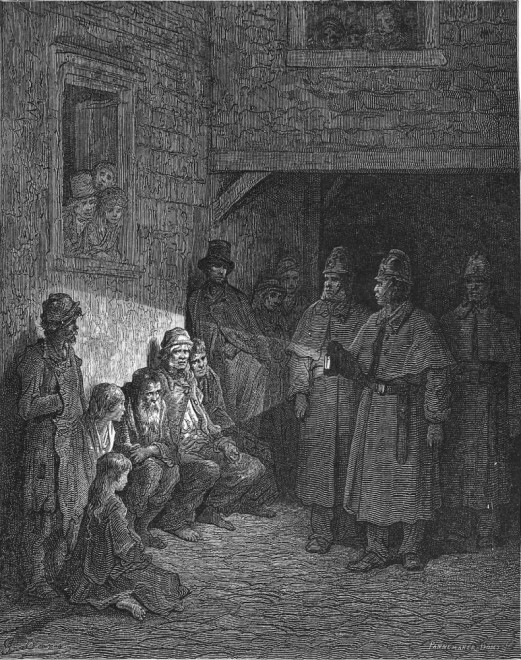 Visits included shelters, gambling houses, cheap lodging houses and the opium den described by Charles Dickens in The Mystery of Edwin Drood. They also visited throughout the West End, attending fashionable events at Lambeth Palace, boat races and the derby, for example. The ambitious project, which was delayed by the outbreak of the Franco-Prussian War and then the Commune, required of Doré another trip to London and more relentless sketching nights, as the artist explained: “From the first gleam of Aurora until the moon sinks to rest I am in cabs, beating round the cardinal points of this great city.” While walking around the streets of London, Doré would take rapid notes and make rough sketches to back up his incomparable visual memory, only to execute large gouache washes such as the work at hand upon returning to his hotel room. It is probable that these fine finished washes in folio format were intended to be presented to potential publishers. In this book and watercolor, Doré’s modern vision of London lies somewhere between the portraits and genre scenes of polite society as exemplified by James Tissot and the contemplative landscapes of Claude Monet, who spent time in London during the Franco-Prussian War. The Bull’s Eye epitomizes Doré’s technique for capturing life in the dangerous neighborhood of Whitechapel. 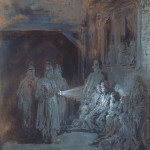 It shows three uniformed bobbies, or members of the Metropolitan Police Force, using a lantern to illuminate a crowded scene in a slum alley. Heightened with white gouache to create a halo, the exposed yet imperturbable group is revealed in the beam of the bull’s eye, chins down, awaiting their fate.